Got the Quilts for Kids top finished! I will be basting it tomorrow. I have hot pink thread that will work for quilting, too. I have to make monkey pj pants for J tomorrow so he'll have them for pajama day on Friday. 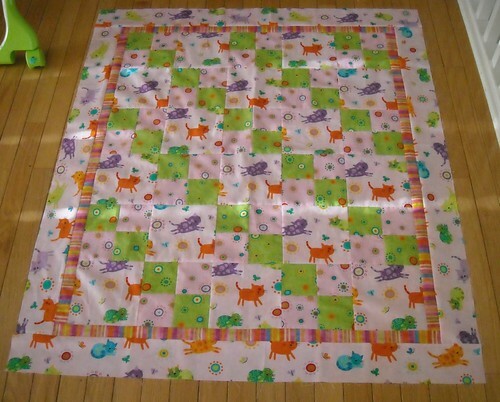 For the KCMQG charity project, I still need to make a quilt back and probably will be quilting one quilt, maybe two. These aren't due this week though. I went to JoAnn's today for batting (I have enough now for the next... 5 quilts) and came home with some fun remnants. One is piratey; I also got a wide wale black corduroy and an embroidered dark gray twill. And I bought a yard of cute corduroy for a fall/winter dress for L. I'll try to post a picture tomorrow. How about you? Have you made progress on your UFOs? Very cute! I've made progress on a project I started this week! The quilt top is complete it just needs quilting but I want to do some more practice quilt sandwiches before I attempt it on the quilt top. Really cute! And with pink quilting it'll be such a great quilt - brave choice of thread! I have a UFO that is just sitting there...I should commit to finishing that! Love the quilt top! Sounds like a fun trip to JoAnn's!